Many of our hunts take place, at least in part, during the dark. It pays to have a good flashlight to enter and exit your stand/blind. Don't forget you will need a cooler or ice chest to transport your kill home after your hunt. One standard size ice chest per 150 lb hog is sufficient. Hogs are very keen to scent. Scent control spray is highly recommended. You can purchase this at most local sporting goods stores. We do our best to hunt from stands and use the wind direction to our advantage. Oklahoma requires a $25 captive feral license fee that can bee applied for here. This needs to be purchased prior to arrival and brought with you to the ranch. After you have harvested the number of animals you paid for, your hunt is over. You can always pay for additional animals. Once you draw blood on any animal, that is considered your animal. We book our hunts as two-day hunts to ensure the maximum number of opportunities (morning & evening for two days). If you hunt two full days and do not see a hog, you don’t pay anymore than the security deposit. 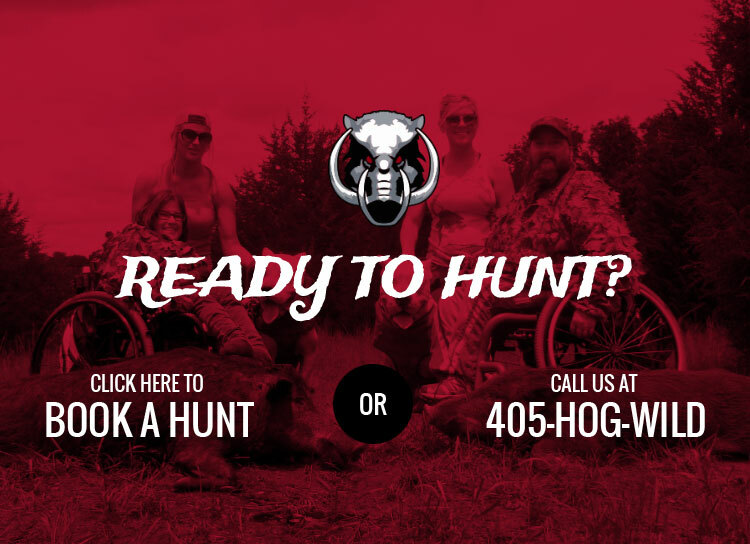 If you decide to enter the field for a second hog, you have then committed to the purchase of that hog. You will be expected to take that animal, not just "empty sit" or hang out while your hunting partners complete their hunts. CHECK-IN TIME- Please be courteous of this time, thank you. Your check-in time for the lodge will always be the previous evening before your hunt at 6pm or later. Our Lodge and Guides will not be available until this time and the gates will not be open until 6:00 PM. Our guides appreciate your observation of this time, thank you. Tipping your guide is a tradition in the hunting industry and clients new to guided hunting often ask us for guidance on gratuities. While tips are made at your discretion, they should always reflect the quality of service provided. A standard guide gratuity is 20% of your total hunt.